What makes Deep Tissue Therapy so Unique? Deep tissue laser therapy utilizes the power of light concentrated and altered by laser to penetrate skin and drive healing energy into tissues. 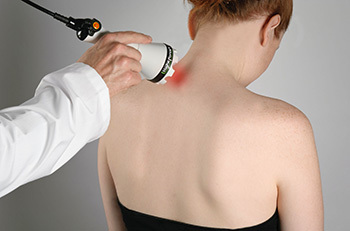 The main therapeutic effect of this laser application is to facilitate and accelerate the body’s ability to repair damaged tissue in both chronic and acute cases. This laser has demonstrated the ability to significantly enhance the body’s natural defenses, while reducing pain! What can the laser do for me? The Class IV laser treats a wide variety of conditions, including but not limited to; arthritic issues, soft tissue injuries, degenerative conditions and neurogenic conditions. You will also notice a reduction in inflammation, pain and edema. Healing time is typically faster and repaired tissues are strengthened after each treatment. What does the Deep Tissue Laser feel like? Our deep tissue laser gives off a warm sensation during treatment. When therapy is applied using the roller-ball apparatus, the sensation can mimic that of a gentle warm stone massage. Most therapy sessions range between 5 – 15 minutes. The laser utilized by our Practice is quick, painless and safe! Clinical studies have found no adverse side effects, only benefits! Be sure to talk to Dr. Chris and our knowledgeable staff regarding any concerns you may have of this treatment option. When should I start feeling results? How long does it last? Schedule your appointment with our team today! Dr. Chris is an in-network provider for most insurance companies.